If you’re baking fish, roasting vegetables or preparing a piece of meat for dinner tonight, chances are that you’ll wrap your food in aluminium foil. What you may not realise is that some of the foil will leach into your meal – and this could be bad for your health. Research that I conducted with a group of colleagues has explored the use of aluminium for cooking and preparing food. Aluminium doesn’t just appear in foil: it is the most popular cookware material used by people in developing countries. Pots and pans are lined with it and it is found in some kitchen utensils like large serving spoons. Copper used to fulfil this role, but over time it’s been replaced by aluminium because it is cheaper to mass produce and easier to clean. But while cooking your food in aluminium pots or pans isn’t a bad thing, placing it in foil and putting it in the oven is problematic. This is especially true with acidic or spicy food that’s prepared at high temperatures. Human bodies can excrete small amounts of aluminium very efficiently. This means that minimal exposure to aluminium is not a problem: the World Health Organisation has established a safe daily intake of 40mg per kilogram of body weight per day. So for a person who weighs 60kg the allowable intake would be 2400 mg. But most people are exposed to and ingest far more than this suggested safe daily intake. Aluminium is present in corn, yellow cheese, salt, herbs, spices and tea. It’s used in cooking utensils, as described above, as well as in pharmacological agents like antacids and antiperspirants. Aluminium sulfate, which is derived from aluminium, is used as a coagulant during the purification process of drinking water. Scientists are exploring whether over-exposure to aluminium may be posing threats to human health. For instance, high concentrations of aluminium have been detected in the brain tissue of patients with Alzheimer’s disease. Scientists have examined the community of old people with Alzheimer’s and concluded that it is a modern disease that’s developed from altered living conditions associated with society’s industrialisation. These conditions may include high levels of aluminium in daily life. Aluminium poses other health risks, too. Studies have suggested that high aluminium intake may be harmful to some patients with bone diseases or renal impairment. It also reduces the growth rate of human brain cells. Given all of these proven risks, it’s important to determine the aluminium concentration when cooking. Pots and other cookware tend to be oxidised, providing an inert layer that prevents the aluminium from leaching into food. The problem is that when you scrub your pots after cooking, that layer is worn away and the aluminium can seep into your food. This is easily avoided: when you get new aluminium pots, boil water in them several times until the base becomes matt. This creates a natural oxidation that prevents leaching. They may look nicer when they’re scrubbed and shiny, but a matt base is better for your food and your health. But cooking your food in foil is a different story. 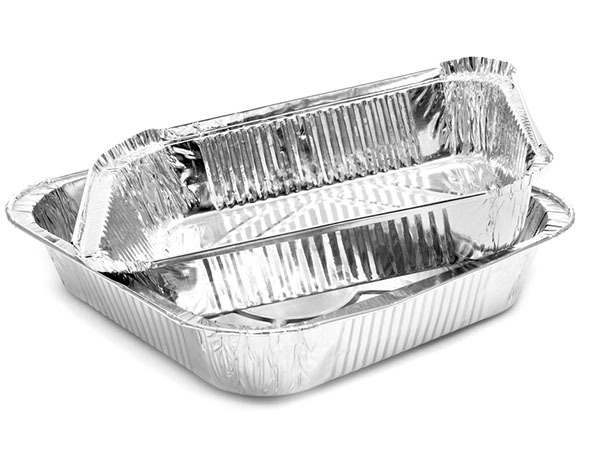 Aluminium foil is disposable and you will not be able to create that inert layer prior to using it. My research found that the migration of aluminium into food during the cooking process of food wrapped in aluminium foil is above the permissible limit set by the World Health Organisation. Aluminium is significantly more likely to leach into food, and at higher levels, in acidic and liquid food solutions like lemon and tomato juice than in those containing alcohol or salt. Leaching levels climb even more when spice is added to food that’s cooked in aluminium foil. Anything acidic sparks a particularly aggressive process that dissolves layers of aluminium into food. This research suggests that aluminium foil should not be used for cooking. Instead, we’d recommend using glassware or porcelain when preparing baked dishes. It’s safe to wrap cold food in foil, though not for long stretches of time because food has a shelf life and because aluminium in the foil will begin to leach into the food depending on ingredients like spices. This article was republished under a creative commons license. Please read the original article by The Conversation, here.